Actively fight back with Nicorette gum to help relieve tough nicotine cravings. For smokers who smoke more than 20 cigarettes per day. To help you quit smoking for good. Sugar free. 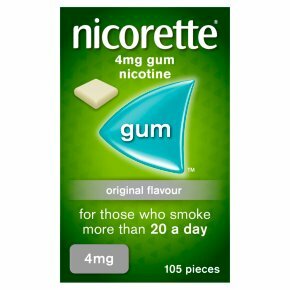 Whether you're reducing one cigarette at a time or quitting for good, choose NICORETTE® Gum to help control your nicotine intake. By giving you control over how much nicotine you use, you can effectively deal with your withdrawal symptoms as they happen. When used correctly, NICORETTE® Gum can significantly help your chances of stopping smoking successfully versus willpower alone. NICORETTE® Gum acts fast to help you deal with cravings. The nicotine is absorbed quickly through your mouth and gums, relieving those unpleasant withdrawal symptoms soon after they strike. So if you're armed and ready with NICORETTE® Gum, you're much less likely to get caught out by a craving. Directions: For adults and children 12 years and over. Please read the enclosed leaflet carefully before starting to use the product and note the chewing technique. Chew one piece of gum when you feel the urge to smoke. Do not use more than 15 pieces a day. Nicorette Chewing Technique: 1. Chew slowly until taste becomes strong. 2. Rest between gum and cheek. 3. Chew again when taste has faded. You are more likely to quit smoking when using this product with help from your pharmacist, doctor, a trained counsellor or a support programme. Warning: Do not exceed the stated dose.<br><br>If you are pregnant, or you need any other advice before using this product, talk to your doctor, pharmacist or nurse.<br><br>Do not use if you are allergic to any of the ingredients listed.<br><br>Keep out of reach and sight of children.